abstract This section describes various ways of playing back Sahi scripts. To playback via Controller, go to the Playback tab, choose the script to play and click "Play". 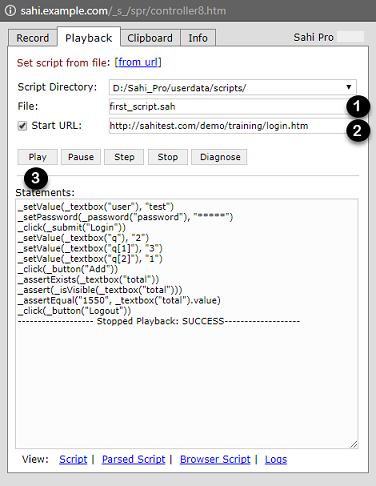 As the script executes, Sahi will display the steps executed and also log them into a database. You can view the logs by clicking on "Logs" link at the bottom of the Controller. The enhanced Editor (available from v6.0.0) allows the user to playback scripts, suites, data driven suites and scenarios from a web interface. Scripts/Suites can be playbacked on a single machine or distribute across machines. One can also generate ANT xml content for various scenarios from the Playback UI. Please refer to the Playback section of the Editor documentation for more details on the Playback UI. One can now use the Editor Playback UI to generate the ANT xml automatically. Refer here for details on the UI. Choose the Run in parallel option. This will generate the contents of an ANT xml file. If you wish to add a Retry target as well, click on the Show Retry Target button on the next window. NOTE: The main target is the default target, so you do not need to specify the target when running the xml. The above UI would generate an ANT xml that looks like the following. * Copyright Tyto Software Pvt. 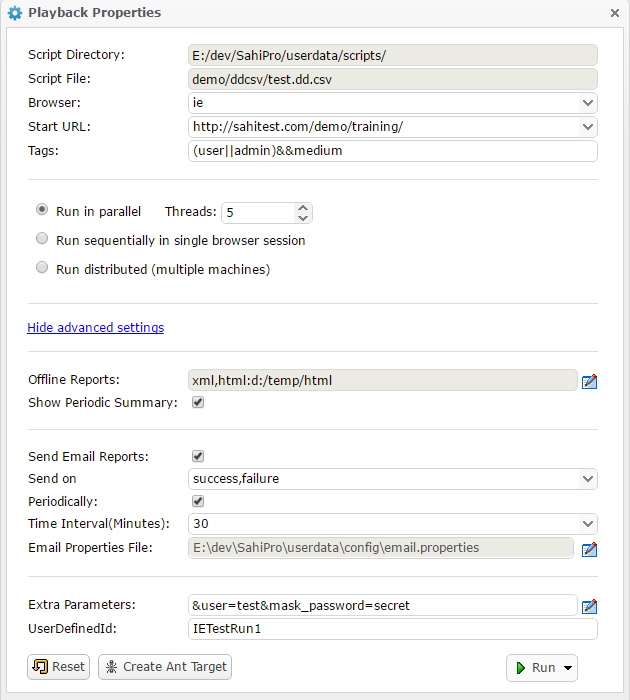 Ltd.
info If you choose the Run sequentially in single browser session option, singlesession attribute would be set to true. Everything else remains the same. danger Please NOTE: The above XML content is for illustration purposes only. Use the Editor UI to generate the ANT xml content and create an xml with that content in your <SAHI_INSTALLATION_FOLDER>. Let us look at the important attributes used in the ANT xml target (specified in bold above). info taskdef classpath is relative to where ant is run from. scriptName Relative path to the script/suite/data driven suite. It is relative to scriptDir. threads Number of simultaneous browser instances on which sahi tests will be run. singlesession Since this is a parallel run, it will be "false". If "true", runs all scripts in a single browser without closing it between scripts. showPeriodicSummary Takes "true" or "false". If "true", a periodic summary of script status is logged in the Ant Console. sendemail Takes "true" or "false". If "true", Sahi sends an email summarizing the playback. emailtrigger Takes "success" or "failure" or "success,failure". Triggers email in case of SUCCESS, FAILURE and both cases respectively. emailproperties Path to the properties file that contains details about the mail viz. information about the sender, receiver, host, port, subject, content etc. Path can be the absolute path or relative to where this ant target is run from. sendemailperiodically Takes "true" or "false". If "true", Sahi will send emails periodically till the suite run is complete. sendemailperiodicallytime Specifies the interval in minutes at which periodic emails are to be sent. failedSuiteName Name of the failed suite. It is of the form <suitename>_failed_<browser>.suite. failedsuite Relative path to the failed suite. It is relative to scriptDir. tags Tags should be specified only for dd.csv and .csv suites. Tags are specified so that it is easy to choose which scripts/testcases to run. eg. in the target above, all the scripts which have 'medium' tag and 'admin' or 'user' (or both) tag will be run. userdefinedid The unique id that the user can pass to differentiate a suite from others. This is an optional attribute. 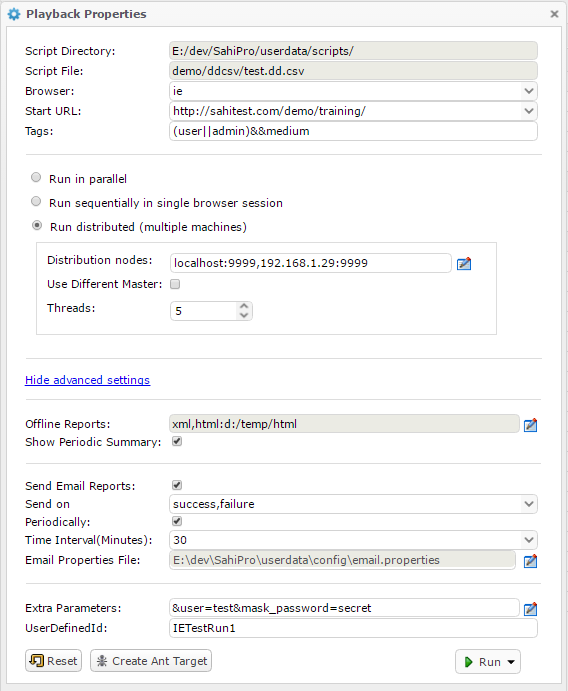 customfield Custom fields can be passed to the scripts using the customfield attribute. More than one custom field can be passed, by specifying additional customfield entries. Replace the custom field keys and values as appropriate. This is an optional attribute. report Sahi can set offline logs to be generated in xml, html, junit, tm6 and excel types. The default type is html. Add separate entries for each report type as required. This is an optional attribute. Distributed playback can be achieved through ANT targets as well. These targets can be used from Jenkins to distribute the scripts of a suite on multiple machines. The machine which distributes the scripts and manages the distributed run is referred to as the Master. All logs are visible from the Master. The other machines are called Slaves. Any machine in the distributed environment can serve as the Master. The machine which launches the distributed run is referred to as the Initiator. Use the Editor Playback UI to generate the ANT xml content. Choose Run distributed (multiple machines) option. Leave the Use Different Master checkbox unchecked. Click on Create Ant Target button. node Each node attribute specifies a machine on which the tests should run. Add as many node entries as there are machines to run. The nodes may or may not include the Master machine (localhost). If the Master machine is not included, scripts will not be run on the Master. There can be 1 or more nodes. Check the Use Different Master checkbox and choose the Master details. danger Please NOTE: The above XML content is for illustration purposes only. Use the Editor UI to generate the ANT xml content and create an xml with that content. node Each node attribute specifies a machine on which the tests should run. Add as many node entries as there are machines to run. The nodes may or may not include the Master machine. If the Master machine is not included, scripts will not be run on the Master. There can be 1 or more nodes. infoFor details about sending emails, please refer Sending Emails. If a value for an item is not provided, then system defaults will be used. mail.smtp.starttls.enable boolean If true, enables the use of the STARTTLS command (if supported by the server) to switch the connection to a TLS-protected connection before issuing any login commands. Note that an appropriate trust store must configured so that the client will trust the server's certificate. mail.host String The server to connect to. mail.port int The server port to connect to. mail.user String Default user name. mail.smtp.auth boolean If true, attempt to authenticate the user using the AUTH command. mail.isSSL boolean If true, uses SSL to connect and use the SSL port by default. mail.to String Email address of the sender's To field. For multiple address separate by comma(,). mail.cc String Email address of the sender's CC field, for multiple address separate by comma(,). mail.bcc String Email address of the sender's BCC field. for multiple address separate by comma(,). mail.subject.prefix String The subject prefix for the email. Emails that get sent out at the end of a suite run, use a template. This template can be viewed from email_template.txt in the Configure UI. The layout, format and content can be modified. With regard to content, the following information can be added. warning The variable names are to be specified in UPPER case. If subject is provided in email_template.txt then mail.subject.prefix property will not be prefixed for the mail. If subject is not provided in email_template.txt then default subject will be set in the mail. warning email_template.xsl has been introduced from Sahi Pro 7.5.0. email_template.txt has been removed from the Configuration. The following information is applicable for distributed runs on the same Master as well as on a different Master. It is applicable irrespective of how the run was executed - Editor, ANT xml, batch file or shell script, etc. In versions prior to SahiPro 6.1.0, the entire scripts folder would get synced to different nodes. If the scripts folder was huge, this would take time and also cause memory issues at times. As of SahiPro 6.1.0, we only sync the scripts necessary to execute a run. Please refer to _resource API on how to include resources used in your scripts. Prior to SahiPro 6.1.0, if there were multiple nodes, priority would always be given to the first node in the Nodes list, and would decrease as we go to the end of the nodes list. Thus you would always find that more scripts were run on the initial nodes than on the nodes at the end of the list. As of this release, scripts are assigned to nodes one by one so long as capacity is available on the node. So scripts get rotated and the distribution becomes more even across Nodes. For example, assume that there are 4 nodes, the capacity of Chrome browser on each node is 5, and that there are 50 scripts to distribute. Prior to SahiPro 6.1.0 - The first 5 scripts will go to Node 1. If at the time of assigning the 6th script, any of the earlier 5 scripts gets completed, the 6th script would also go to Node 1 since it has free capacity. As of SahiPro 6.1.0 - The first script will go to Node 1, the second to Node 2, and so on. Scripts rotation can be switched off by setting the flag drun.run_scripts_in_rotation to false in userdata.properties. By default, this value is true. From SahiPro 6.1.0, the nodes participating in a distributed run are now monitored internally. If syncing of scripts failed for a node the first time, syncing will be attempted periodically. This means that if you start a Node in the middle of a distributed run, scripts will be distributed to this Node as well. The health of each node will be checked at regular intervals. Only healthy nodes will get scripts. Thus script distribution will not be hampered by a Node that has gone down. Node monitoring can be turned off by setting the flag drun.nodes_monitoring_enabled to false in userdata.properties. By default, this value is true. It is now possible to register a new Node for a currently running distributed run. Nodes can be registered for a currently running suite. The suite can be specified either using userDefinedId or suiteId. If both are specified, suiteId will be used. suiteId for the current run can be found from the Suite Info section of the Suite report logs. info Multiple nodes can be specified using comma separator. If more than one node is specified, use double quotes for the nodes. Note that these values are indicative. Please use your own values. Pass "" as the second parameter for userDefinedId. Multiple nodes can be specified using comma separator. If more than one node is specified, use double quotes for the nodes. Please note all these values are indicative. sahihost Hostname of the Master where Sahi is running (Can be IP as well). node Specify one entry each for every node that you want to register. info Specify either userDefinedId or suiteId. If both are specified, suiteId will be used. warning WARNING: Killing a suite (or all running suites) in the middle of a run is not a routine task. You would kill a suite only if something went wrong and you wish to stop the suite execution. Stop All from the Editor can be used to kill all running scripts/suites. This is now possible through an ANT target as well. The ANT target gives the ability to kill a specific running suite or kill all the running suites. If neither suiteId nor userDefinedId is specified, all running suites on this Master will be killed. If you wish to kill a specific suite, use suiteId or userDefinedId. If both are specified, suiteId would be used. In a distributed run, scripts get copied to Nodes in temp/scripts/copied directory, under timestamped folders. At the end of the run, these timestamped folders get deleted. Likewise, in a distributed run on a different Master, scripts first get synced to a timestamped folder inside temp/scripts/staging directory of the Master. At the end of the run, these timestamped folders get deleted. These changes have been done to support sharing of a Master or Node between different distributed runs at the same time. If for debugging purposes, one wants the staging and copied folders to remain undeleted, one can set the flag drun.debugging_enabled to true in userdata.properties. Please refer to instructions in sahi.properties. Use with extreme caution. By default, this value is false. It is possible now to use a machine as Master for different distributed runs in parallel. The same applies for Nodes as well. This could be useful in a Test Lab kind of environment where a powerful machine can serve as the Master for multiple distributed runs. By default, a periodic summary of the script execution is shown when running the scripts from Script Editor, Ant, Testrunner, Drun and Drun Diff Master. Whenever there is a change in the status of script, it will be printed in the Console or shown as an Editor notification. There are two kind of messages that come up in the console. timestamp Time Stamp of the Initiator machine. status: scriptname Status of the script (STARTED, PASSED, FAILED) followed by script name. Testcases: passed / total_ran Total number of testcases passed / Total number of testcases executed. Scripts: passed / total_ran Total number of scripts passed / Total number of scripts executed. BROWSER: browsername Browser on which the script was executed. info NOTE: The Initiator and the Master machine should be on Sahi Pro v6.3.0 for this to work. We would recommend you to use Sahi Pro v6.3.0 on the slave machines as well. In the New Project window, choose Maven Project. In the New Maven Project window, choose Create a simple project, and leave other default selections. Open the context (right-click) menu for the Maven Project, choose Build Path, and then choose Congifure Build Path. 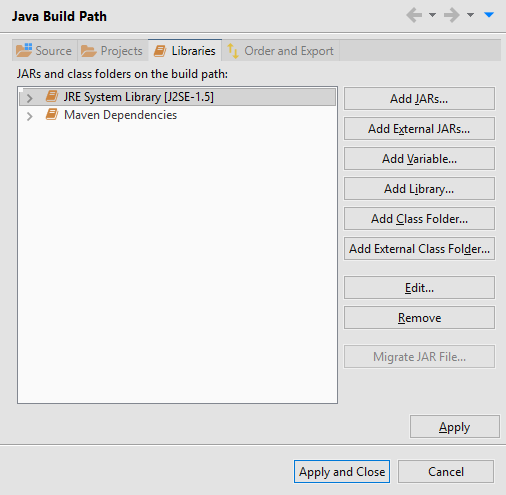 In the Java Build Path windows, select JRE System Library under Libraries. 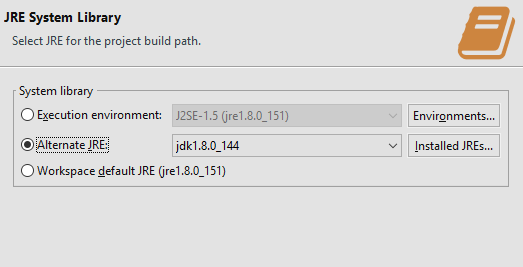 Click Edit then select Alternate JRE and browse JDK path installed in your System. infoChange SahiInstallationDir, target name and antfile accroding to your Configuration. 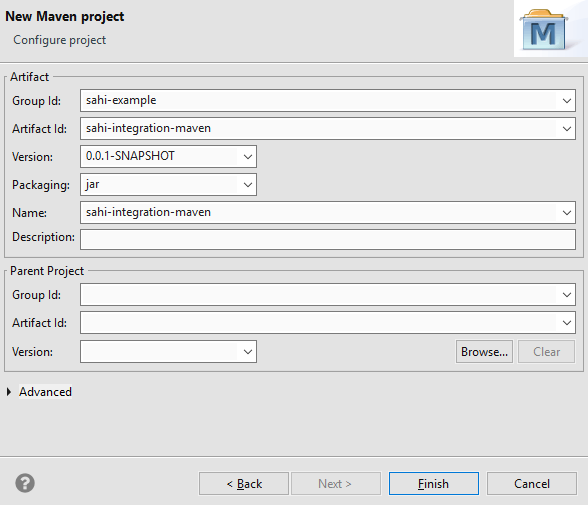 Run : open the context (right-click) menu for the project, choose Run As, and then choose Maven generate-sources, Maven test etc. Node.js must be installed in the system. TypeScript must be installed in the system. Copy <SahiPro>/userdata/scripts/demo/typescript/sahi_apis.ts file in your TypeScript workspace. Open the TypeScript workspace in MS Code and build the project. Open a command prompt/bash, cd to TypeScript workspace and run tsc.